Do you have a straight staircase in your home? Then the Acorn 130 straight stairlift is the perfect match for you. With a durable aluminum rail and comfortable, padded seat, this lift will make stairs of any height a total breeze. A lockable swivel seat allows you to easily get off without the need to twist your body. The Acorn 130’s chair, arms, and footrest fold into a slim profile when not in use to allow complete, unobstructed use of the stairs as normal. It also has five safety sensors that automatically stop the lift if any obstruction is encountered. All these features and more mean that the Acorn 130 is the perfect solution for anyone in a two-story home with a straight stairway who thinks they need just a bit more mobility in their lives. Two remotes are included for access by multiple users, and the lift runs on battery power so it can remain operational in case of a power outage. Featuring all the same amenities as the Acorn 130, the Acorn 180 is devised with a dynamic home design in mind. Compatible with straight, curved, winding staircases, multiple landings, and more, the Acorn 180 is made to accommodate even the most unusual of architectural imagination. The ingenious designers and creators of Acorn 180 ensure that it provides a comfortable, smooth ride all along the stairway while still maintaining a slim, stylish look. Its self-leveling system makes even the steepest of stairways seem like a breeze, and the smooth stops at the ends prevent any jarring that other stairlifts experience. Like the Acorn 130, two remotes are included to allow unimpeded use even with multiple users in one household. It is also battery-powered, allowing unimpeded use even in the case of a power outage or other unexpected events. 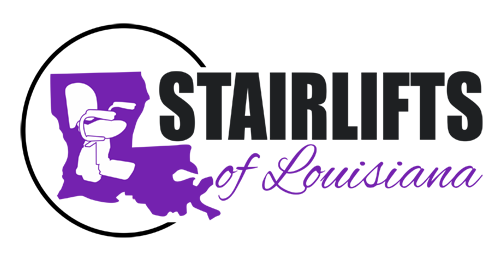 With our top-of-the-line Acorn stair lifts at Stairlifts of Louisiana, you no longer need to depend on anyone when you need to move up and down the stairs in your house. Call us today and let our team of expert technicians install the stair lift for you. Regain your mobility and enjoy the freedom of being able to do the things you want.